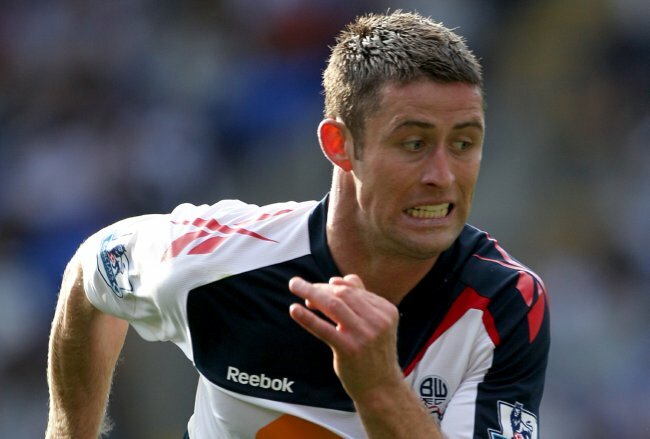 Despite being continually valued at somewhere between £15-20 million by Bolton themselves, the Daily Mirror are reporting this morning that Arsenal have lodged a frankly derisory bid for centre-half Gary Cahill…of just £6 million – roughly one third of the sticker price. That’s right, with money in the bank and the transfer window dwindling to nothing, Arsenal are apparently still mucking about with low-ball offers. To be fair, it is thought that the £6 million bid contains a few ‘extras’, i.e, a gourmet food hamper, a six-piece luxury luggage set and a coupon for 20% off coupon at WH Smith. It’s not all doom and gloom though as we’re also hearing that Wenger is in advanced talks over a €5 million, nine-month loan deal for 30-year-old Marseille midfielder Lucho Gonzalez. Elsewhere, word on the wire is that Liverpool ‘within hours’ of completing a deal to re-sign Craig Bellamy on a free transfer from Man City, after City agreed to pay-off the final year of the Welshman’s £95,000-a-week contract at Eastlands. Best put a padlock on the golf club cupboard at Melwood. Bellamy is being signed on a one-year deal (with the option of an extension) as cover for first-choice front pair Luis Suarez and Andy Carroll, with current back-up David N’Gog now expected to join Bolton over the weekend for around £3.5 million. Why is it a pathetic bid? He has 1 year left of his contract. Gael Clichy had 1 year left and he went for just £7m despite champions league experience. He’s worth about 15m but because he’s in his final year the max they can hope for is £10m. Wake up and look at the facts, not an international regular and no champions league experience. £6m is a very good offer. @Mark: It’s already been rejected. Do you guys even know what a negotiation is? ffs we got Arshavin for around 15 million these guys know what they’re doing. Mark, he may have a year left, but he is Boltons main defender who they bought in for 5 mil themselves. So for a mil+ extras, and having a week to find a new main defender, as a bolton fan i say noooooooo. Id rather keep him for the season and send him off on a free to a club that wants him far more than arsenal do. Its realy an insult. Comeing from the club that cried foul at Nasri leaving with a year left for what ? @ Marc: yup, we know what negotiations are, as does wegner. evident when he whats-his-name, whose-his-face and hey-hey-im-19 this summer. wenger said that number is a lie. i have a feeling there were add-ons that bolton forgot to mention, as well as a swap player by the name of bendtner. if you add 3mil in add-ons and bendtner (still worth at least 7mil), there’s you 16mil. bolton probably want straight cash, which is their prerogative. Let’s all stop claiming to be transfer experts, we all have the same background knowledge (football manager). As for Bellamy, the golf bags won’t be needed until they play against Fulham.